Merry Christmas, if that’s your thing. Your DGB for today is to go outside and pick up some trash. 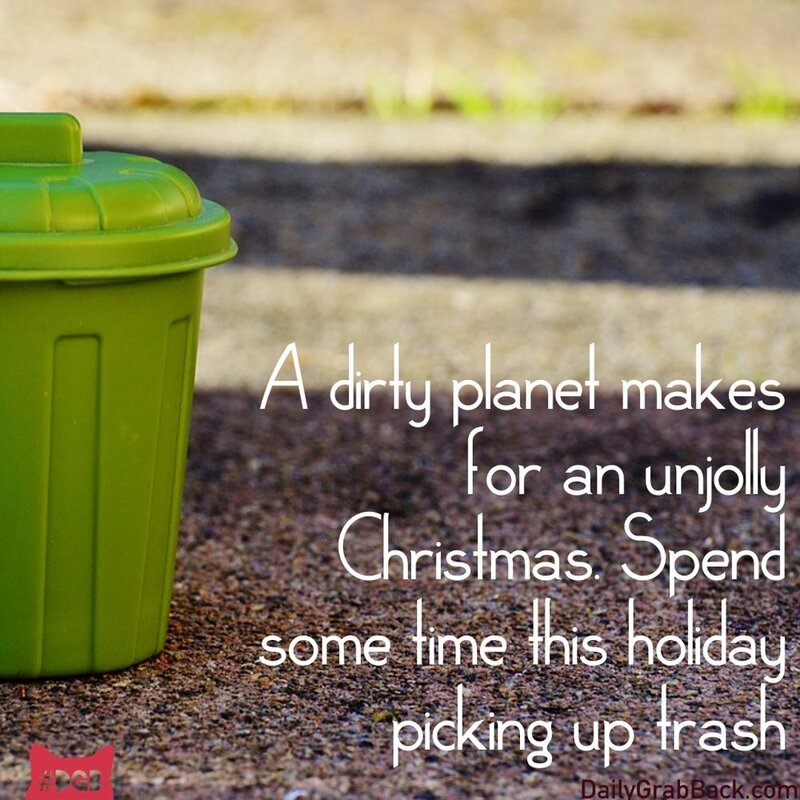 This is a holiday tradition for us, dating back to 2016, and an opportunity to include the whole family in environmental stewardship. Your DGB for today is to be vigilant. Is Your School District Segregated? Studies have shown that all children, both white and minority, benefit from attending a diverse school. Let’s grab that opportunity back for them. One of the keystones of systemic racism here in the United States is the School to Prison Pipeline: a descriptor for the way minorities are funneled into prison starting with the way the are treated by their public schools and districts. The Department of Education now has a searchable database that allows you to see just how your own school or district is handling things like gifted and talented (G&T) enrollments and disciplinary situations. Ideally, the percentages will roughly reflect the enrollment data. So for example, if your school or district is 85% white, 5% Black, 5% Latinx and 5% Asian, your G&T and suspension rates will shake out into similar numbers. Sadly, this is often not the case. One DGB staffer noted that although her school of reference contained 4.8% Black students they made up over 9% of the out-of-school-suspensions. Folks, this is not acceptable. Black and other minority students are regularly punished more often and with greater consequences than white students, yet there is no data that illustrates they are breaking the rules more often. Use this information to grab our students out of the prison pipeline. Your DGB for today is to read this passionate piece on the importance of birds to the world, to humanity, and take steps to protect these animals in your immediate vicinity. As promised, the Trump administration is turning out to be the most viciously anti-environment, anti-natural world administration in US history. But even before Trump was denying climate change, doing away with environmental regulations, and otherwise running roughshod over the planet, birds have been in trouble. Pesticide use, air and water pollution, habitat destruction, aforementioned climate change, and even the humble house cat have affected bird populations. Keep your cats indoors, or, put a bell on ‘em to warn birds they’re coming. Felis catus is responsible for an eye-popping 2.4 billion-with-a-b bird deaths a year just in the United States. Stop using pesticides on your garden, or find ones that are less harmful to birds. Avoid neonicotinoids, especially, as they are deadly to both birds and pollinators. We know it’s kind of early to be mentioning it, when you’re done with your Christmas tree (should you celebrate), leave it in your yard as a habitat for birds instead of putting it on the curb. Same for brush piles. Your feathered friends will thank you. We know these days it seems like so much is out of our control. These small steps are doable and have real, tangible results right in your backyard. Do it for your mental health, if nothing else. Hope is a thing with feathers. Your DGB for today is to help the Southern Poverty Law Center (SPLC) update their Whose Heritage? Confederate symbol tracker. Do you have a throwback monument to our country’s traitorous past in your town? The SPLC is compiling a comprehensive list of every Confederate plaque, statue, and memorial that exists today. Unfortunately, due to the rebranding the South was gifted post-Reconstruction, many of these symbols exist in some pretty weird places. And by weird we mean, not the Southeastern United States. Whether you are in California or Wisconsin, please keep your eyes open for these archaic icons. Because we can’t get rid of them if we don’t even know they are there. Grab our public spaces back from racist traitors. 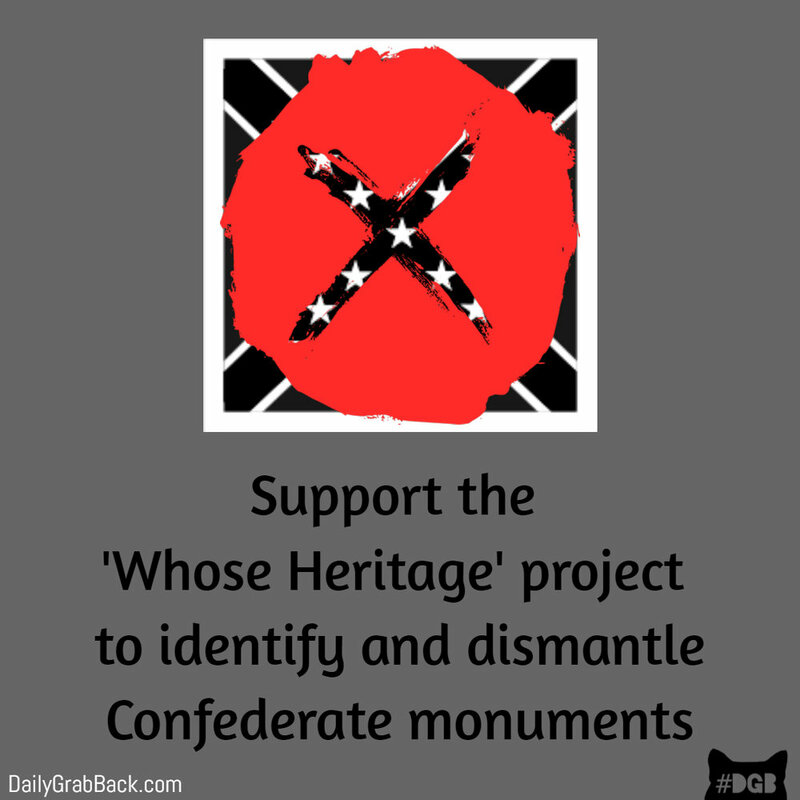 Tagged: DGB, Confederate Monuments, SPLC, Southern Poverty Law Center, Whose Heritage? Your DGB for today is to familiarize yourself with strategies to de-escalate racist harassment and assault, especially if you have white privilege and can use it to help Black and brown folk. Last week two Black men were arrested for hanging out at Starbucks. And a Black teenager was shot at for ringing a white person’s doorbell to ask for directions. As if we need more reminders, it is clearly not safe to be Black in this society. And PoC need more than non-racist allies, they need ANTI-racist allies willing to use their white privilege to help on the front lines. In the video taken of the Starbucks incident, you can see white people attempting to intervene with the police on behalf of the two Black men. This is a great use of their white privilege. It didn’t have the desired result in this case, but maybe if they’d had a little more information and training, it would have. Maybe someone could have convinced the Starbucks employee not to engage in racial profiling and call the cops in the first place. So check out the resources to which we’ve linked, and learn how to stand up to racism, rather than just being a bystander. And one more thing: given the way that Black people’s lives are put at risk in encounters with the police, please think twice before calling the cops on a Black person. We had a Grab all planned out for today about supporting those awesome teachers on strike in West Virginia but they had the nerve to receive their demands and are going back to class! So the first part of your DGB for today is to give a shout out to the #55strong on Facebook or Twitter and show the world that solidarity WORKS! The next part of today’s Grab is getting you ready to support the next teachers’ strike because we hope that this is just the beginning. (There are already rumblings coming out of Oklahoma.) The National Education Association, the teachers union that includes professional educators starting at preschool and going up through university, has some resources for you to peruse and prepare for the discussions, debates and deliberations that a local teachers’ strike will entail. Starting with a Fact Sheet that will help dispel myths and misinformation, there are several informational resources posted on their Union Rights page and we hope you will go and read up. The teachers in West Virginia did not win this deal without the support of their community so please be ready to grab back and support the teachers in your own. Your DGB for today is to learn how to properly dispose of an American flag. You don’t know what you’ve got until it’s gone, which is why we’re all probably feeling a little more patriotic now that our democracy left us. We’re driving around, listening to Drake*, remembering the good times, and regretting how we took Obama’s America for granted. We never even took her dancing. Still... we had our problems. We fought a lot. We said some things we didn’t mean, like threatening to move to Canada. But America said some things too, like that some people were more equal than others. We’re just so conflicted these days. Sometimes we want to cherish the old flag America left at our house and other times we want to burn it to the ground. Well, if you’ve got an unwanted flag lying around, you can do both. A Veterans of Foreign Wars post will dispose of your flag for you in an official burning ceremony. Your local VFW is also a good resource for many community-centered activities and events, especially for veterans and their families. * DGB recommends you never Drake and drive, as you could end up at your ex’s house. Your DGB for today is to look into options for proclaiming your home or business a safe space. Since the election, neighborhoods have come together to protest hatred and bigotry with different exterior displays. One popular way of demonstrating inclusiveness is the rainbow peace flag, which you can find on Amazon. Another option is the Hate Has No Home Here sign. We at DGB understand that the American flag theme and colors don’t necessarily represent all of us, and we recognize that the Hate Has No Home Here signs aren’t perfect. Recently, there has been some recognition that the traditional rainbow flag also leaves people of color underrepresented, which prompted a modified version to be released. You can find downloadable artwork on the More Color More Pride site, which means you can even create your very own extra gay, extra inclusive super yard sign. On a personal note, those of us at DGB who are minorities find these neighborhood signs comforting. Better still, our children recognize them as signifying safe places and love spotting them on car rides. Your DGB for today is to recruit your mayor to fight climate change! We want you to contact the mayor of your city or town and ask them to commit to following the guidelines laid out in the Paris Agreement. Last week our illustrious President decided to pull the United States out of the Paris Agreement forged to fight climate change. This is despite the fact that his best friends in Russia elected this year to participate. In a tweet about the move Trump stated “I was elected by voters of Pittsburgh, not Paris. I promised I would exit or renegotiate any deal which fails to serve US interests." What Trump failed to realize before tweeting is that the voters in Pittsburgh overwhelmingly voted for Hillary Clinton and their mayor, Bill Peduto, was having none of that nonsense. He clapped back, hard. “As the mayor of Pittsburgh, I can assure you that we will follow the guidelines of the Paris Agreement for our people, our economy & our future.” Holy covfefe! Climate change is going to impact everyone. Let’s get our local politicians to follow the leadership Mayor Peduto is showing here. So whether you’re in Modesto or Millington, Poughkeepsie or Portland, we are asking you to reach out to your mayor and get them to help mitigate this short-sighted and idiotic move by our President. Your DGB for today is to contact your local representatives, if applicable, or a representative in a nearby state and demand they remove all Confederate monuments. New Orleans has been in the news lately for removing all of the Confederate monuments in their city. Many applauded this move, but some fought against it, even forming a tiki torch brigade and trying to intimidate the workers removing the statues. We applaud New Orleans, but the United States has a serious Confederate monument problem. There are more than 700 monuments, spanning 31 states, and some in states that fought against the Confederacy. We have even seen 35 monuments erected since 2000. We are asking you to contact the Mayors of cities that have Confederate monuments and implore them to follow the lead of Mayor Mitch Landrieu and remove the monuments. This list of monuments isn’t complete, but it’s a start. Your DGB for today is to honor our forests. What does that mean? Well, the theme for this year’s International Day of Forests is Forests & Energy. Take a moment to watch this video, and take this quiz to learn a little something about forests and energy. We all know the environment is feeling a little threatened lately (ok, that’s a projection, but you know what we mean), and could use our support. Plan to get out in nature this week and do some vintage activism by hugging a tree. Your DGB for today is to seek out opportunities for our youth to participate in anti-bias education. It starts early, it starts at home, and you can partner with local schools to ensure the message is sent far and wide. You truly are helping to shape a future generation. Recently, a group of high school seniors took their senior class photos. You may remember taking your own high school class photo, but what you (hopefully) don’t remember is having approximately 70 of your classmates give the Nazi salute, or shout “Heil Trump, heil Hitler!” while your photo was being taken. Yes, that is exactly what happened in a Texas high school. Appalled? Us too. This cannot happen. What exactly IS anti-bias education? Check out the National Association for the Education of Young People’s (NAEYC) Anti-Bias Education site to learn more. You can find additional resources for anti-bias education here. We must first remember that there are many amazing youth in our country, who do good things for other people each and every day. For these children, we should continue to be role models in the fight against bigotry, hate, and racism. For those being taught to discriminate, we need to intervene as early as possible. Make sure the heirs of our country take it from us with an understanding of tolerance and inclusivity. Your DGB for today is to spread a little kindness. We’ve had some positive news this past week with the decision to uphold the stay on the Muslim ban by the 9th Circuit Court of Appeals, so let us use this ray of hope to keep working toward positive outcomes within our communities. February 12th through 18th has been designated as Random Acts of Kindness Week and there’s even a foundation you can check out, where you’ll find a variety of ideas on how to pay it forward through random individual acts. Have you seen that commercial which reminds us the difference between “nice” and “kind” is that “kind” is honest? We at DGB don’t normally get our inspiration from granola bar commercials, but this sentiment struck a chord. So, look for opportunities to spread some kindness this week. Buy coffee for the person behind you in line, pay a meaningful compliment, get a little real. Or, if you’re looking to dig a little deeper, read about these people who peacefully blocked a van attempting to take a woman to an ICE detention center. Spontaneous opportunities for kindness are all around us, and it’s not the particular act that’s most meaningful but the feeling of personal connection one leaves with another. Your DGB for today is to watch this short video on school pushout: and share this with your circle, especially the educators in your life. Download the toolkit here. School pushout is a form of race and gender bias. Minority girls (and boys) are suspended at higher rates than their white peers for the same infractions and It starts early: black children make up 18 percent of preschoolers, but make up nearly half of all out-of-school suspensions. If you don’t personally know anyone who works in a school and don’t have children who attend, you can find your neighborhood school here, and pass this resource to the administration via email or regular mail. All kids in every community deserve equal opportunity for quality education unhindered by bias. Let's tell them we've done our homework and they can't chalk this up to poor behavior. It's time to Let Them Learn! Your DBG for today is to support your public library! Get library cards for you and your family members (if you’re not already card-carrying members) and donate either directly to the library, or to your public library’s “Friends of…” organization. If you’re not sure where your local library is, go here to find out. Public libraries are more than books and literacy (though these certainly justify their existence). Public libraries are community hubs, cultural centers, educational resources, First Amendment defenders, repositories of history, and even part of the social safety net for the most vulnerable among us. Read more here. Unfortunately, library funding has been hard-hit by the financial meltdown of 2008, and has yet to rebound. We have a President-elect who has signaled a distinct lack of respect for the free exchange of ideas – public libraries are a key part of a society that values such things. The wealthy and influential Koch Brothers have funded at least one anti-library initiative. And, most disturbingly, public libraries have become targeted in the surge of hate crimes since the election. It is more important than ever to support your public libraries however you can!